Patients with uterine leiomyosarcoma usually present with abnormal or irregular bleeding, vaginal discharges, heaviness of abdomen or pelvic mass. They may present with breathlessness due to anaemia caused by blood loss which is usually taken care of with blood component therapy. Right heart thrombi in transit are an extremely rare presentation of uterine leiomyosarcoma which has to be picked up early because of its aggressive nature and association to high rates of pulmonary embolism & mortality. He we report a case of uterine leiomyosarcoma who presented to us with features of right heart thrombus in transit. Right heart thrombus may develop within the right heart chambers or they may be peripheral venous clots that accidentally lodge in the right heart on their way to the lungs known as right heart thrombi-in-transit (RHThIT) or travelling thrombus. Right heart thrombus is rarely seen in the absence of structural heart disease, atrial fibrillation or a device located in the superior vena cava or the heart chambers such as catheter or pacemaker leads etc. Here we report a 43 year old lady who presented to us with complains of weakness and breathlessness of three days duration and diagnosed to be a case of right heart thrombus in transit with pulmonary embolism. After thorough evaluation she was diagnosed to have uterine leiomyosarcoma. Uterine leiomyosarcoma usually presents with pain or heaviness of abdomen & abnormal uterine bleeding. Presenting as right atrial thrombus in transit is extremely rare. A 43 year old female was admitted with complains of breathlessness on moderate exertion, chest discomfort & uneasiness for three days. There was no history of chronic illness in the past. She was a teacher by profession. She was having menorrhagia for past two years. Her cycles were regular. On examination she had moderate degree of pallor. There was no icterus or lymphadenopathy. Bilateral pitting oedema was present. Pulse was 110 per minute, regular, good volume & bilaterally symmetrical. There was no radio femoral delay. All peripheral pulses were well felt. Her blood pressure was 200/100 mm hg in right arm supine position. Clinically chest was clear. Respiratory rate was 16/minute. Oxygen saturation was 98% on room air. First and second heart sounds were audible normally. No additional sounds & murmurs were heard. Abdomen was soft. There was no hepatosplenomegaly. Examination of nervous system did not reveal any abnormality. Complete blood count revealed moderate anaemia with leucocytosis. Haemoglobin was 7.7 gm/dl, TLC-13400/cu mm. Platelet count was normal (197,000/cumm). Serum iron was 35.2 mcg/ dl. Peripheral blood smear examination showed features of iron deficiency anaemia. Random blood sugar was 142 mg/dl. Her lipid profile was deranged with serum cholesterol of 237 mg/dl & serum triglyceride of 203 mg/dl. Serum uric acid & thyroid profile was normal. Kidney & liver function tests were within normal limits. ECG showed sinus tachycardia. Chest X-Ray revealed cardiomegaly with increased bronchovascular markings. Examination of fundus was also normal. In view of menorrhagia opinion of gynaecologist was taken. Per speculum examination was normal. Per vaginal examination revealed bulky uterus. Ultrasonography of abdomen & pelvis showed fatty liver, mildly dilated pelvic calyceal system of right kidney. Uterus was bulky (12 × 7.3 × 10.7 cm) with multiple fibroids (largest size was 5 × 5 cm at fundal region). Ovaries were normal. She was diagnosed to have iron deficiency anaemia due to menorrhagia because of fibroid uterus & essential hypertension. Baseline echocardiography revealed mild diastolic dysfunction. She was treated with antihypertensive agents, haematinics & other supportive care. But her symptoms worsened. She became more dysnoeic. A repeat arterial blood gas analysis was normal. A repeat echocardiography was done which revealed large serpigenous mass probably a large clot seen in the right atrium crossing across tricuspid valve (Right atrial Thrombus). Source was not known at this stage. Patient was shifted to intensive care unit, treated with intravenous heparin 5000 units bolus followed by infusion 1000 units /hour. Continuous cardiac monitoring was done. Family members were prognosticated and the case was urgently referred to a higher cardiothoracic centre. Repeat echocardiography done at the referral centre confirmed the same finding as ours. CT Angiography revealed thrombus in right atrium & right ventricle. Ultrasonography of abdomen & pelvis showed multiple 4-5 cm diameter, heterogenous, ill-defined space occupying lesions in uterus distorting the normal shape & size. Trans vaginal ultrasound (TVUSG) confirmed the findings of grossly bulky uterus with intramural fibroid. In CECT abdomen thrombus is seen from right internal iliac vein to Inferior venacava (IVC) & right ventricle. Along with it right ureter was seen to be dilated till mass in pelvis. There was heterogenous enlargement of uterus with enhancement of lesion involving cervix & body of uterus suggestive of neoplastic mass. There was no evidence of deep vein thrombosis in doppler study of lower limb vessels. ECG done at this stage was suggestive of pulmonary embolism. A revised diagnosis of large fibroid uterus with large serpigenous propagating mass originating from Iliac veins & pulmonary embolism was made. Her serum CA125 was within normal limits. She had the thrombus removed by pulmonary thromboendarteriectomy followed by insertion of IVC filter as the whole of the thrombus could not be removed lower down. The clot was removed up to renal vein. Mass removed was subjected to histopathology which showed blood clots. There was no evidence of malignancy. Follow up revealed a normal ECG. There was no residual mass seen in 2D Echo (Figure 1A- 1C). Doppler lower limb vessels & pulmonary angiography was normal. However CT angiography showed a linear thrombus in IVC, right common iliac vein till level of renal vein. There was hydronephrosis in right kidney. A heterogenous mass of size 9.2 cm × 7.6 cm was seen in uterus along with collection in pelvis superior to the mass. Right lower ureter was compressed by the mass. So a laparoscopic total abdominal hysterectomy & bilateral salpingo-oophorectomy (TAH & BSO) was planned which was converted to laparotomy. Subtotal hysterectomy & BSO was done. Cervix and a portion of tumour attached to posterior aspect of cervix left behind as the ureter was difficult to identify and the tumour was extending laterally. Histopathology report was consistent with leiomyosarcoma showing spindle shaped tumour with high cellularity, marked pleomorphism & atypical mitoses. From the cardiothoracic centre patient was referred to oncology centre with the diagnosis of uterine leiomyosarcoma with migrating thrombus to right atrium, right ventricle & pulmonary artery, obstructive uropathy, hydronephrosis, chronic anaemia & hypertension (Figure 2). There she was treated with chemotherapy. After three cycles she came back to her home town. She was readmitted with complains of pain abdomen & vomiting. Though her vitals were within normal limits moderate ascites was present. Routine Investigations showed anaemia with mild leucocytosis. Serum creatinine was 5.0 mg/dl, PT/INR was high. Repeat ultrasonography showed bilateral hydrouteronephrosis, large pelvic mass & ascites due to recurrence & probable metastasis. CT scan of whole abdomen showed portal vein of normal calibre with no intraluminal thrombus or collaterals. She was treated conservatively with injection vitamin K, intravenous fluids, haemodialysis, blood &blood component therapy & other supportive care. She went again to oncology centre for next cycle of chemotherapy. Unfortunately she succumbed to her illness there. Figure 1A-1C. 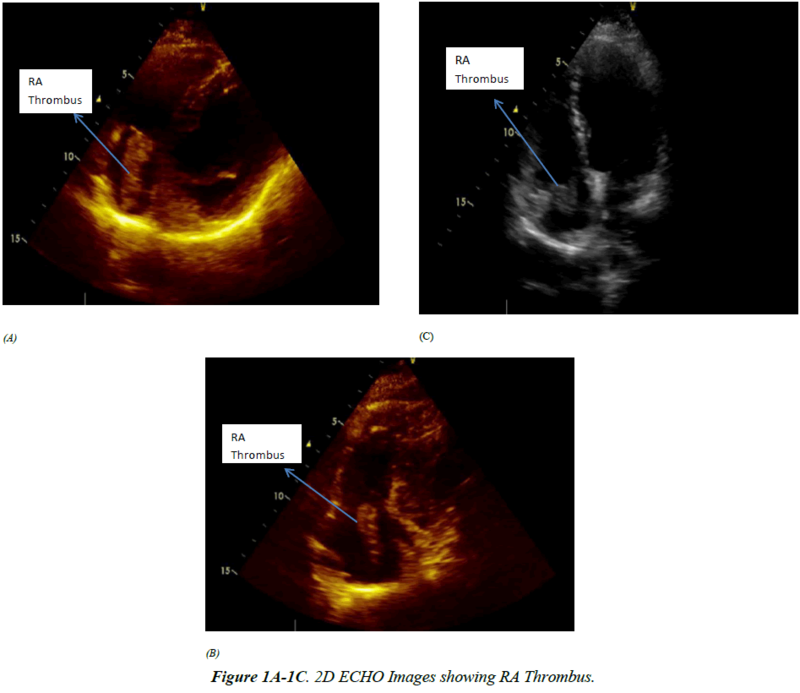 2D ECHO Images showing RA Thrombus. Figure 2. 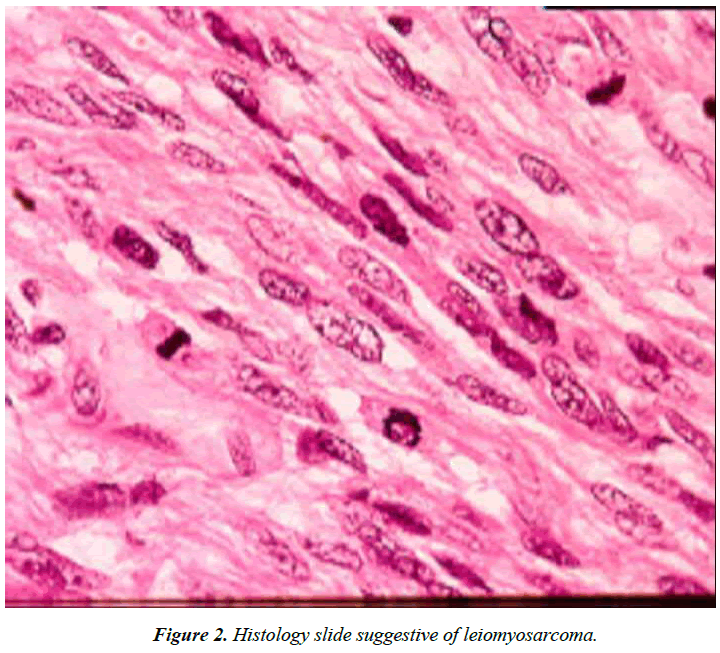 Histology slide suggestive of leiomyosarcoma. Uterine leiomyosarcoma is a rare malignancy & carries a poor prognosis. It is a malignancy of soft tissue and accounts for 5-10% of soft tissue sarcomas . Uterine leiomyosarcomas have been known to metastasize to distant organs including the lungs, abdomen, brain, breast, bone, skin, pancreas and the kidney [2-7]. Brain metastasis has been rarely observed and peritoneal sarcomatosis has been occasionally documented. It is rare to detect an ER (oestrogen receptor) & PR (progesterone receptor) positive mass actively growing on heart valve. These tumours often present in the fifth decade of life, usually as a pelvic mass with vaginal bleeding. In our case she was in her forth decade & presented with breathlessness which was rapidly progressive. The presence of a long serpentine and elongated mobile mass extending from inferior venacava or the veins of lower body in to the right atrium should raise the suspicion of leiomyoma/leiomyosarcoma in a female with history of menorrhagia though it is extremely rare. In the present case echocardiography and contrast enhanced computerized tomography revealed thrombus from right internal iliac vein to IVC & right ventricle. Right heart thrombi are always diagnosed by echocardiography. In 1989, the European Working Group on Echocardiography identified three patterns of right heart thrombi type A B & C. Type A thrombi are morphologically serpigenous, highly mobile and associated with deep vein thrombosis and pulmonary embolism. It is hypothesized that these clots embolise from large veins and are captured in-transit within the right heart as seen in our case. Type B thrombi are nonmobile and are believed to form in situ in association with underlying cardiac abnormalities. Type C thrombi are rare, share a similar appearance to a myxoma and are highly mobile. Clinical consequences of right heart thrombus in transit (RHThIT) depends upon the clot size and overall clot burden. Sudden cardiovascular collapse is the worst outcome therefore it is considered as extreme emergency. Case series reported high in hospital mortality of 44.7% due to sudden pulmonary embolism . Presentation of patients with RHThIT is variable from mild respiratory symptoms, as in our case to cardiogenic shock & sudden death. Transthoracic echocardiography is the screening test for diagnosis of right heart thrombi in transit with 50 to 60% sensitivity but may underestimate the clot size. Trans oesophageal echocardiography detects the thrombus with higher accuracy. Contrast enhanced CT scanning is also a cheap and non-invasive technique that diagnose the thrombus with higher accuracy. The optimal therapy for RHThIT is an ongoing debate. Existing published reports differ in their recommendations for treatment by advocating surgical removal, administration of thrombolytic agents, anticoagulation therapy with heparin or using interventional percutaneous thrombus retrieval techniques. Kinney and Wright found similar mortality rates for surgery, thrombolysis & anticoagulation with heparin (38%, 38%, and 30%) respectively  and thus concluded that heparin therapy was the treatment of choice because of its safety profile. Although there is no clear consensus or treatment guideline, rapid diagnosis & aggressive management is essential. An individualized approach should be targeted depending on patients characteristics. We have used heparin in our case and shifted to tertiary care centre where thrombectomy along with insertion of IVC filter was done. Catheter based interventions might be options when surgery & lytic therapy are contraindicated . Although intravenous leiomyomatosis is a well-known entity, the occurrence of intravenous extension of uterine leiomyosarcoma is extremely rare which can extend in to right atrium [11-13]. Though in most cases leiomyosarcoma presents with irregular vaginal bleeding, vaginal discharges, pain abdomen or pelvic fullness it can present with features of right heart thrombus as in our case. The exact aetiology of right heart thrombus in transit in leiomyosarcoma is not documented. However the hypercoagulable or prothrombotic state of malignancy may be the contributing factor for it to develop. The tumour cells produce and secrete procoagulant/ fibrinolytic substances and inflammatory cytokines, and the physical interaction between tumour cell and blood (monocytes, platelets, neutrophils) or vascular cells lead to inflammation & thrombus formation. Other mechanisms of thrombus promotion in malignancy include nonspecific factors such as the generation of acute phase reactants, abnormal protein metabolism and hemodynamic compromise (i.e., stasis). Uterine leiomyosarcomas are aggressive, heterogeneous cancers associated with high rates of progression and recurrence and poor outcome. Uterine sarcomas as a group are uncommon cancers, representing approximately 8% of all uterine malignancies , of these uterine sarcomas, 42- 60% are of the leiomyosarcoma subtype . The rarity of the disease stress upon a high index of suspicion in patients presenting with abnormal vaginal bleeding. It has to be kept in mind that uterine leiomyosarcoma may present as right heart thrombus in transit as in our case which is a potentially fatal condition. Female patient presenting with complains of menorrhagia should lead to the suspicion of uterine malignancy. Echocardiography should be done as a screening test in these cases to detect cardiac thrombus. Gustafson P, Willen H, Baldetorp B, et al. Soft tissue leiomyosarcoma. A population based epidemiologic &prognostic study of 48 patients, including cellular DNA content. Cancer 1992;70:114-119. Nishida T, Shoji S, Itoh T, et al. Metastatic lung tumor from uterine leiomyosarcoma(in Japanese) KyobuGek. 2006;59:1191-1196. Saylam B, Ozozan OV, Duzgun AP, et al. Perforated intestine leiomyosarcoma as a metastasis of leiomyosarcoma; A case report. Cases J. 2009;2:9288. Yamada S, Yamada SM, Nakaguchi S, et al. A case of multiple brain metastasis of uterine leiomyosarcoma with a literature review.SurgOncol. 2011;20:e127- e131. Sibartie S, Larkin JO, Lee G, et al. Metastatic uterine leiomyosarcoma presenting as a breast lump. Ir J Med Sci. 2011;180:889-891. Barbetakis N, Paliouras D, Asteriou C, et al. Cutaneous skull metastasis from uterine leiomyosarcoma : A case report. World J SurgOncol.2009 ;7:45. Allessi E, InnocentiM, Sala F. Leiomyosarcoma metastatic to the back & scalp from a primary neoplasm in uterus. Am J Dermatopathol. 1985;7:471-476. Chartier L, Bera J, Delomez M, et al.Free floating thrombin the right heart: diagnosis, management & prognosis indexes in 38 consecutive patients. Circulation. 1999; 99:2779-2783. Kinney EL, Wright RJ. Efficacy of treatment of patients with echocardiographically detected right-sided heart thrombi: a meta-analysis. AmeHeart J. 1989;118:569-573. Kronik G. The European cooperative study on the clinical significance of right heart thrombi. Eur Heart J. 1989;10:1046-59. Coard KCM, Fletcher HM. Leiomyosarcoma of the uterus with a florid intravascular component (“Intravenous Leiomyosarcomatosis”). Int J GynecolPathol. 2002;21:182-185. Moorjani N, Kuo J, Ashley S, Hughes G. Intravenous uterine leiomyosarcomatosis with intracardial extension,” J Cardiac Surg. 2005;20:382-385. McDonald DK, Kalva SP, Fan CM, et al. Leiomyosarcoma of the uterus with intravascular tumor extension and pulmonary tumor embolism, CardiovascInterventRadiol. 2007;30:140-142.